My name is Milly and I come from Taiwan,Taipei. I am very interested in history, geography and traveling and my dream is to travel around the world and meet new friends. I have a passion for cycling and enjoy helping people to plan their cycling trips in Taiwan. I was also a leader of a cycling club in the National Taiwan Normal University. Welcome to Taiwan and join me as I show you a different side to this beautiful city. This was a great experience and Milly was so helpful in showing us around Pingxi. She definitely takes into consideration your plans and what you want to see. I highly reccomend taking this tour for those who are not too knowledgeable of the Pingxi area and need someone to show you around. 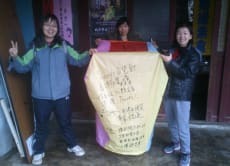 The highlight of the trip was learning to build our own sky lantern, where as everyone around us bought theirs we had the privilege to make our own before launching it. Thanks Milly! This was the best tour we took in our 3 weeks in Asia! Milly was great (in fact, she was more than great); we had specific requests for the tour and they were granted. We arrived into Keelung via a cruise ship and Milly was able to coordinate our trip accordingly. In addition, she arranged for food tasting in local markets which was another huge plus. I can't recommend Milly enough!!! Fantastic trip. Very well organised. 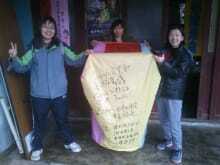 Making a Sky Lantern was a great experience and the nearby waterfall was beautiful. Highly recommended.